A New Year. A New Wave. To provide a bit of backstory, 2010 has been a mixed bag for this Creative Beast, with some decent highs, and others that were… perhaps neither good nor bad. There were times that felt pretty bad, in all honesty, and they did set me back. Yet in hindsight, the simple knowledge that I was able to make it through these trials–some of which I wasn’t sure how I would get through–has led me to a better place. I surprised myself in more than one instance with my resourcefulness, my tenacity and my will–and when I managed to accomplish certain things on both a personal and a professional level simultaneously–I felt pretty good… albeit tired. My point in mentioning this, is not so much to toot my own horn, but to simply say that waves do come. Sometimes they can take us up, and other times, they can crush us. The best we can do is to prepare if possible, and then paddle like hell. Those who are able to maintain higher ground may consider themselves “fortunate,” or “blessed,” or whatever they want to call it. As for fishermen and Creative Beasts… ’tis a seafaring life–which sometimes resembles a monster, and other times, something extraordinarily glorious… which brings us back to the reasons that we do the things we do. Smiley and I reconnected a couple of months ago by pure chance, at a hotel, of all places. I was coming out of a networking meeting, and he was working on a story in the lounge. I didn’t expect it, but we ended up chatting for a while. He was keen to bounce thoughts off of another writer, and I was pleasantly refreshed after an hour of interesting-but-standard shop talk. The script aside, he seemed to have a lot of fires going, which intrigued me. Everybody likes hot burners, and particularly during cold weather. Looking back, I think what was most compelling about Smiley, was the fire in his eyes. As we talked, we agreed that perhaps there would be an opportunity to collaborate on some ideas. Time went on, and the more ground we covered, the more we realized our stories were rather aligned. We had each had our share of waves, both friendly and fierce. We agreed that it was good to have dreams and vision. All of these things brought us closer together, and at the same time, kept us somewhat reticent in ways. Still, I was inspired by our conversations. New Year’s Eve, though quiet, reflective and low key, was also pensive, heavy and occasionally dark. And I was feeling funky to begin with. Somehow, roads were taken that led us off the gleeful, celebratory path–not that we were really on it in the first place. From setbacks to friends who had committed suicide, and from dislikes to disorders, we covered just about every cheery subject we could think of. By midnight, we were totally out of steam and in no mood for noisemakers or confetti; let alone, champagne. If ever there was a non-roll, we were on it. Smiley went on to say how much he couldn’t wait to move back east. I had very little left to say, except that if that was what he wanted, then he ought to make it so. Mostly, I was just tired, and thinking about having to go in to work the next day. We finished our nightcaps in what was ironically, yet another downtown hotel lounge. We parted ways with half smiles and a short good-bye, each of us somewhat apologetic about our moods. So at this point, you might be wondering the reason for this post. Ha. The post is about waves, and how they keep coming. This can be good or bad, depending on how you look at it. A wave is going to take you somewhere, and that place can, indeed, be good… even great. When I got home I was emotionally spent. One of the things I’ve never liked about the occasion–the anticlimax–had hit me in the face. “To hell with New Year’s Eve,” I thought. 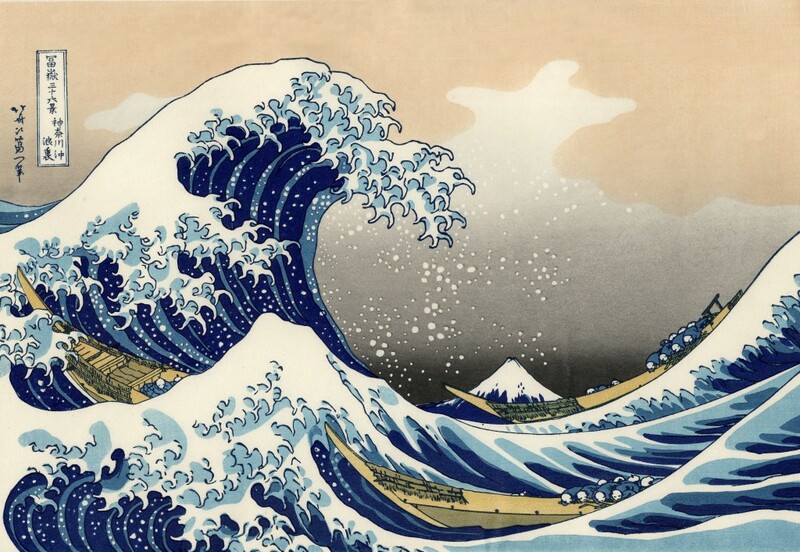 In the morning, when I got up to take a shower, I looked up at the reflection of my Hokusai poster in the bathroom mirror. Yes, the image has become ubiquitous. So what? It’s powerful. Suddenly, it hit me, and suddenly, I was inspired again. “Fight harder. Ride the wave. Come back better.” That’s what it’s about. Pretty simple. Smiley, my friend… this post is for you, and I’m glad we’re friends. Keep at it, and keep smiling. One way or another, we’ll get there. Happy New Year, Creative Beasts, and by all means, SEIZE THE PREY. p.s. It feels appropriate to add the lyrics, here. Feel free to sing along… Slainte.